Ojibway's field trip to Point Pelee on Saturday, September 25 found thirteen species of warblers along the Delaurier Trail. Hundreds of warblers were moving through the woods and along the edge of the marsh with many birds feeding within one or two metres of the observation platform. 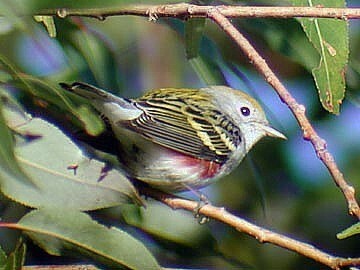 Blackpoll and Black-throated Green were the most common species with only a few Yellow-rumped Warblers recorded. Saturday, September 11: Over 3,000 Broad-winged Hawks spent the night in wooded areas near Ojibway and could be seen circling low over the nature centre during the native tree and plant sale on Saturday morning. The peak period for Broad-winged Hawk migration continues for another week or so. The hawk tower at Holiday Beach is generally the best place to observe hawk migration each fall. Visit the Holiday Beach Migration Observatory for more information and daily raptor counts.